As long as the Earth has been around, its temperatures have changed. Throughout history, there have been natural periods of global warming and cooling. Today, however, modern industries are releasing gases that build up in the atmosphere and cause temperatures to rise much more quickly. Understanding global warming is important if you want to make a difference and protect the planet. What Does Global Warming Really Mean? Global warming today is associated with the rise of temperatures on the Earth's surface because of human industries. According to NASA, the average global temperature has gone up by 1.4 degrees Fahrenheit in the last hundred years. Scientists believe it will continue to rise over the next century. What Are the Main Causes of Global Warming? These numbers might not seem like much, but scientists have discovered that today's temperatures are higher than they have been during most of the last 11,000 years, according to Nature Magazine! Back then, Earth was just coming out of the most recent ice age and was a very different place. A lot has changed since then. Today, there are millions of people living in areas that are threatened by global warming. This warming can lead to major problems, from flooding to severe storms - that's why many call it 'climate change'. 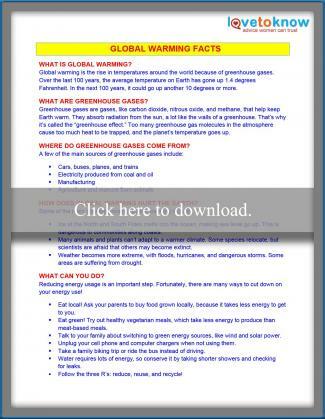 Click the image below to download a global warming fact sheet. You can see a list of causes and effects of global warming and learn how you can help stop it! If you need help, read this guide on downloading Adobe printables. 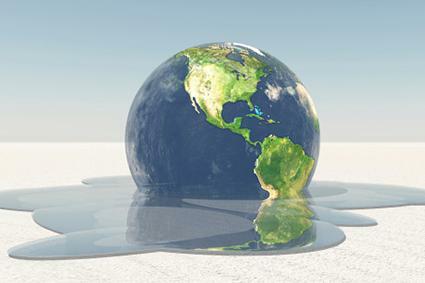 Global warming is caused by a high level of greenhouse gases in the atmosphere. Greenhouse gases, like water vapor, carbon dioxide, and ozone, occur naturally and play an important role. Every day, the sun's rays strike the Earth with radiation. Much of this radiation is reflected back to space by shiny surfaces like ice, but some is absorbed by water, land, and the atmosphere. Greenhouse gases are especially good at trapping radiation that gives off heat. These gases are a lot like the glass walls of a greenhouse that keep plants warm under the sunlight. They help maintain average temperatures on Earth around 59 degrees Fahrenheit, according to according to NASA. However, modern activity, like burning coal and oil, releases a lot of greenhouse gases. When there are too many molecules of these gases in the atmosphere, the greenhouse effect goes into overdrive. Too much heat is captured, and temperatures around the world start to go up. Several different gases cause the warming of the atmosphere. Carbon dioxide, or CO2, is made up of carbon and oxygen atoms. It may be the most famous greenhouse gas. In 2012, CO2 made up 82 percent of greenhouse gas emissions into the atmosphere, according to the EPA. It is released when fuels (like coal and oil), trees, and wood is burned. CO2 is also emitted in some types of manufacturing, like cement. Methane is another gas released when people use coal, gas, and oil. The manure from animals on farms is a major source of methane, as well. Methane made up only 9 percent of the emissions in 2012, according to the EPA. However, compared to carbon dioxide, it has a much higher global warming potential. This means that it's much better at trapping heat, so smaller amounts can cause a bigger problem. Nitrous oxide is a third greenhouse gas that is released during the burning of fuels and other industrial activities. Agriculture, especially raising animals on farms, is another major source of nitrous oxide emissions, according to the United Nations. Nitrous oxide is also a much more powerful greenhouse gas than carbon dioxide. The UN explains that its global warming potential is 296 times that of CO2! Fluorinated gases are used in producing many household items, like refrigerators, air conditioning units, and even makeup. Many industries have switched over to using these gases instead of other chemicals that were causing a hole in the ozone layer, according to the European Commission. However, they, too, have a high global warming potential. How Does Global Warming Harm the Earth? With high carbon dioxide levels in the atmosphere, temperatures go up. Therefore, scientists closely monitor CO2 levels in parts per million (ppm) in order to understand how severe the global warming problem is. In 2008, a group of scientists proposed that a level of 350 parts per million (ppm) was safe for the planet. However, in 2013, that level first went above 400 ppm, according to Scientific American. Year after year, it gets higher. What do high levels of greenhouse gases mean for the world? As temperatures rise, humans and wildlife are at risk. You've probably seen pictures of sad polar bears huddled up on a tiny piece of ice. Higher temperatures mean that ice must melt. At the North and South Poles, there are huge ice sheets, and this melting is happening very quickly. This means that many animals, like polar bears, are losing their habitats. National Geographic reports that Adélie penguins in Antarctica are also disappearing. Over 30 years, only about one-third of their population is left. Melting ice also means something else. All that water has to go somewhere, and it is filling up the oceans. This causes the sea level along coasts to rise. Already, many cities are trying to fight this effect. They spend millions of dollars raising up roads and buildings to higher ground. By the end of this century, National Geographic reveals that we could see a rise in sea level of over 20 inches. This could force millions of people to have to leave their homes in search of a safer place to live. The effects of climate change are already being seen. Rainfall is increasing and contributing to major floods. Severe storms, like hurricanes, are becoming more common and more dangerous. Some areas might be vulnerable to droughts because warmer temperatures will cause more evaporation of water. For example, a drought in California lasting several years has been linked to climate change in a new Stanford University study. Animals and plants also react to changes in their climates. Scientists worry that many species will go extinct if they can't move or adapt to warmer temperatures. National Geographic reports that some species of butterflies, foxes, and plants have begun to move north toward cooler weather. Temperatures in Alaska have been much warmer, creating the perfect climate for one type of beetle that eats spruce trees. This beetle has destroyed many acres of the trees. Warmer temperatures also mean that mosquitoes that carry diseases like malaria can spread to bigger areas. How Can You Help Fight Global Warming? If you are worried about how global warming is hurting the world, there are many steps you can take to make a difference! A lot of greenhouse gas emissions come from burning fuels to produce the energy that powers homes, schools, and businesses. You can talk to your family and school about switching to cleaner energy. There are many sources of green energy that don't contribute to global warming. Wind turbines use air movement to produce power. Solar panels absorb heat from the sun and can be installed on the roofs of buildings to provide electricity. These are called renewable energy sources because they come from resources that are basically unlimited, instead of fossil fuels, which take millions of years to be produced in the earth. The U.S. Department of Energy has more information about green energy sources. Besides switching to green energy, you can also use less energy. Make sure to turn off light bulbs and unplug cell phone and computer chargers when you aren't using them. Check out this EPA guide for more ways to be energy-conscious! Raising animals for food takes a lot of resources, like land, water, and energy. The United Nations also states that nnimal manure, as well as the energy used in clearing land and producing meat, causes 18 percent of worldwide greenhouse gas emissions. Animal agriculture is also the source of 65 percent of the nitrous oxide emissions-a gas with a very high global warming potential. You can help reduce this impact by trying out some delicious vegetarian recipes with your family, like veggie chili or this tasty vegan meal plan. You can also ask your parents to buy food that is produced by local farmers because it takes much less energy to transport than food grown many miles away. Cars are probably the most famous of all when it comes to greenhouse gas emissions. Even if your family doesn't drive a hybrid or electric car, you can still cut down on your gas use. Try biking as a family to nearby locations instead of driving. When going on trips, carpool in large groups, and take public transportation like buses as much as possible. The fewer car trips you take, the less carbon dioxide you put into the air! Be aware of your water usage because it takes energy to bring water into your home, too. That may mean shorter showers from time to time, and of course, turn off the water while brushing your teeth. Use cold water instead of hot when you do laundry to cut down on energy. Check your house for leaks around faucets and toilets, and ask your parents about switching to water-efficient appliances. All of the products people buy, from garden hoses to video games, require energy to be produced. Try to cut down on new things that you buy, and check out a thrift store next time you're looking for cool new treasures for your room. Bring reusable cloth grocery bags on your shopping trips to cut down on plastic bags, which also take an enormous amount of energy to be made. When you do have to throw things out, make sure to recycle your glass, plastic, aluminum, and paper items. Now that you understand global warming, you have the power to help stop it. Every day, you can make choices that reduce your carbon footprint, which is the amount of carbon dioxide you put into the atmosphere. Check out the EPA's online calculator to figure out what your carbon footprint is and what it could be once you start making easy changes in your life! 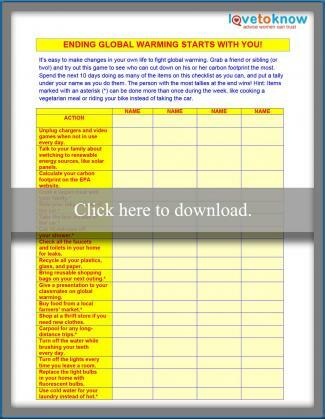 Use the activity sheet below to track changes as you make them. When you're ready to get started, simply click the image to download and print the activity sheet. Challenge your friends or siblings to get active with you. Together, everyone can take small steps that will add up to a big difference for future generations.